Fat cat, skinny cat – what ya gonna do? Obesity seems a rather fitting post-Thanksgiving subject, doesn’t it? However, in this case I’m talking about feline obesity. 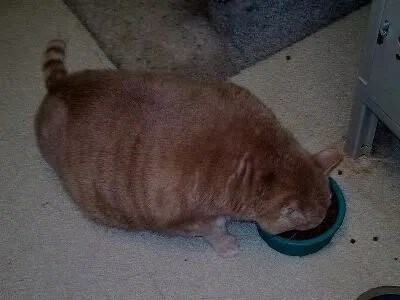 Not coincidentally, recent research shows the most effective method of “normalizing” a cat’s weight is feeding a low-carbohydrate WET diet (canned or raw). Normalizing a cat’s weight means inducing weight loss or weight gain in order to achieve an ideal weight. So, this diet not only works best for those chubby kitties that need to lose weight – but also those skinny kitties that need to put on some weight (particularly muscle)! I witnessed this myself first-hand with my cats, Omaha and Afer. When I adopted Omaha in 2003, he was morbidly obese at over 20 pounds (estimated ideal weight of 8 pounds). Friends of mine compared dry food to doughnuts, candy, or chips recently. They noted that a little bit given to a healthy cat, probably won’t hurt them. I actually agree – but if your cat is anemic, vomiting and/or has diarrhea/constipation, is borderline diabetic (or full-blown diabetic), obese, or has a tendancy to develop urinary tract stones – I would argue (once again) they should be given absolutely NO DRY FOOD! I DO understand about some special cases, but in my opinion there’s a difference between understanding your choices and the risks and benefits of those choices and choosing something for which you feel the benefits outweigh the risks… and making a choice ignoring the evidence, justifying your decision with “my vet said” or “well, all my cats in the past” or “I know cats that”… like the people that *know* canned/raw is better for diabetics but don’t want to bother with the “effort” required to open a can twice a day. So, where does that leave us? Options remaining are a freeze-dried raw food, a frozen raw food, or a canned food. (Or, I suppose there’s the options of a freshly made raw food or whole prey or homemade cooked diet – I won’t go there for the time being.) I realize there are MANY caregivers out there that are reluctant to feed raw for many reasons, and I do not fault them for that! I think commercial canned food is a perfectly acceptable option! While the majority of my cats’ diet is a frozen raw food, I do feed canned food to them on occasion and I feed my foster cats canned food. Why don’t I feed my own cats’ canned food more often? Well, a few reasons including cost (yes, homemade raw is less expensive), palability (if some of my cats get canned, they start clamouring for it and refusing to eat their raw), and a couple cats that had IBD so long before their diet was changed that even most canned foods cause them stomach upset…. among other reasons. However, I’ve seen some people argue against canned food – and I’d like to discuss some of the “reasons” why. I’ve had no fewer than THREE conversations with individuals in the past week regarding their cats and urinary tract disorders (in these cases, urinary tract inflammation and/or stones). In each case, the individual was feeding a dry food. The most effective means of avoiding urinary tract disorders is to feed an all-wet diet. One coworker resisted all of my pushing until his cat landed up blocked and hospitalized, and one surgery and $2,500 later he switched to canned.